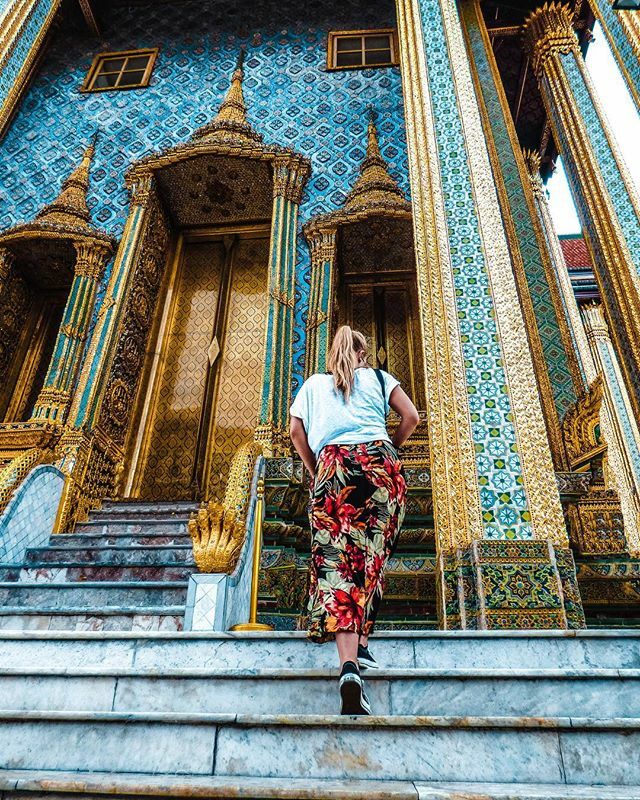 Bangkok is Thailand’s cultural capital, and it has all the things that the Land of Smiles is all about: the royal palace, many ancient Buddhist temples and traditional floating markets. 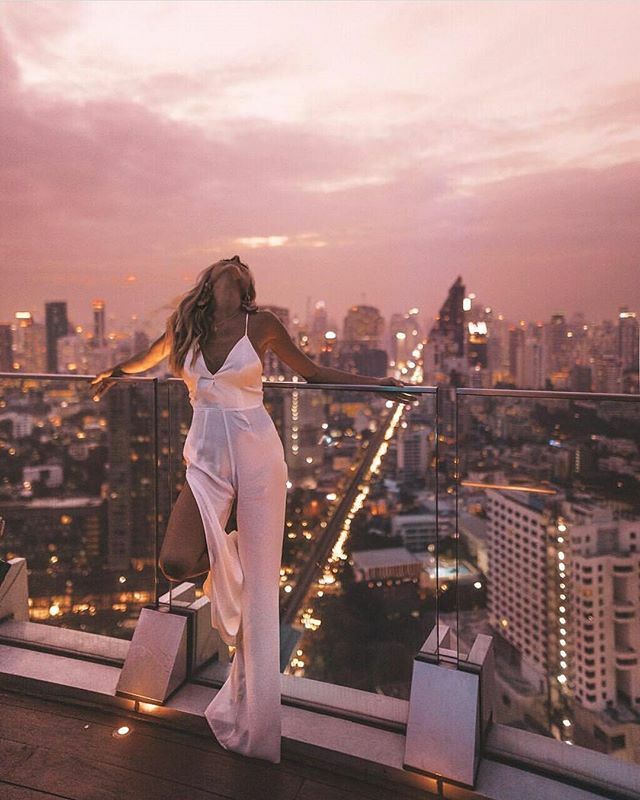 But Bangkok is not only home to old cultural sites and buildings, there are also so many things to do in Bangkok such as eating delicious street food, visitingluxury fashion malls, skyscrapers, and of course, friendly people. Three days in Bangkok gives you enough time to see the highlights and make one day trip out of the city. 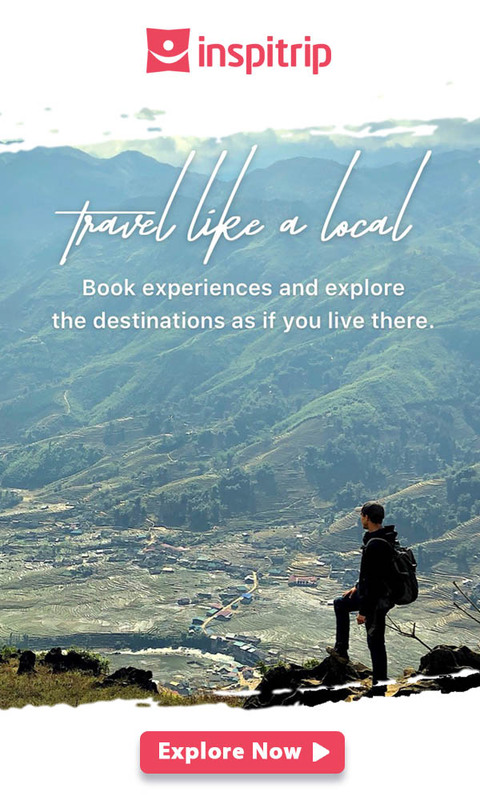 If you are finding difficulties while planning a trip yourselves, our itinerary below will you our recommendations on the best things to do in Bangkok in 3 days. 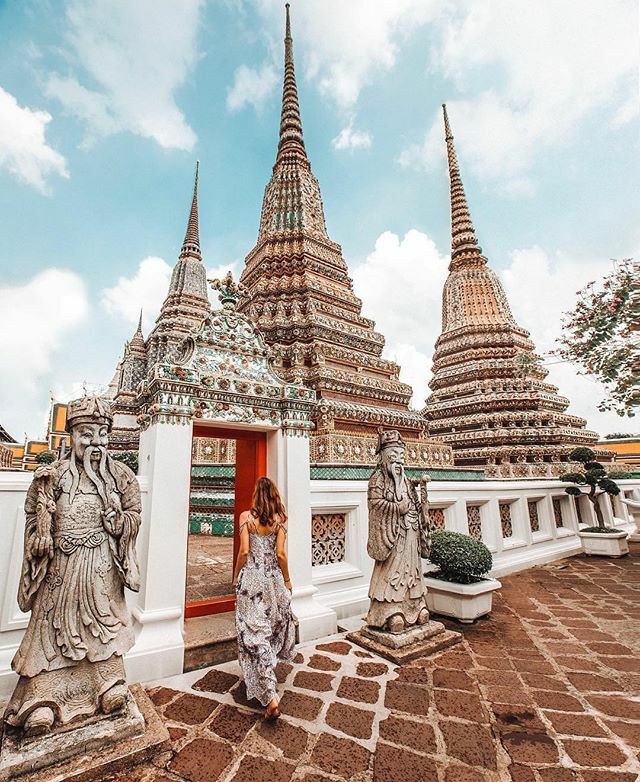 The area along the famous Chao Phraya River used to be the ancient royal district and this is where you’ll find the dazzling palace and some of the most iconic temples in Bangkok such as Wat Arun. To start the day, take the BTS (Bangkok’s skytrain) from the nearest station to Saphan Taksin (marked as S6). The Sathorn Pier is located directly in front of this station. 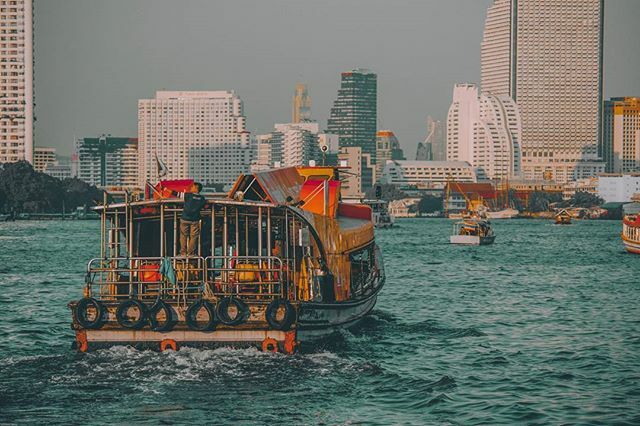 From there, you can easily find many boats that are provided by the Chao Phraya Express Boat Company and run from 9am to 7pm every day. It is recommended to take the boats with orange flag, they pass at a frequency of about 15 minutes and cost 15 baht (regardless of the distance). There are also bigger and less crowded than the boats with a blue flag. They cost about 40 baht for a single trip, or 100 baht for an all-day pass that allows for unlimited trips. The Grand Palace should be your first destination. 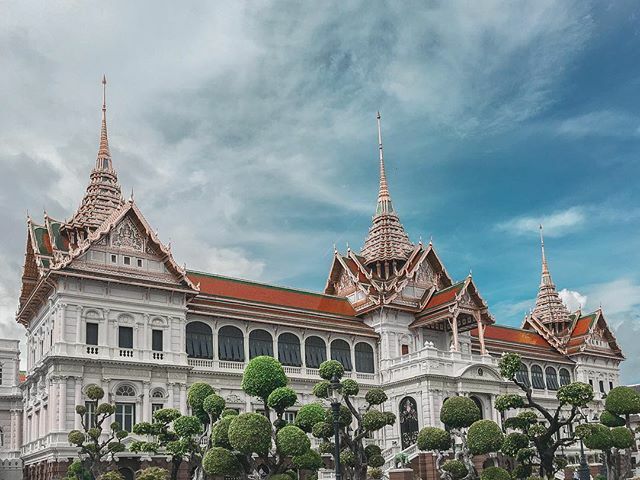 Built under King Rama Ι in 1782, the Grand Palace was once home to the royal family, the royal court and the government administration for over 150 years. This huge ancient complex is so attractive by its creative and ingenious architecture inspired by Europe. With the sheer size of 218,400 square metres, the whole area consists of the Outer Court, the Middle Court, the Inner Court and the Temple of the Emerald Buddha. For any first time visitor, Grand Palace is a must visit on any Bangkok itinerary. Situated on the same ground of the Grand Palace, Wat Phra Kaew is another destination you shouldn’t miss. The temple is not only famous for its unique architecture, but also for the sacred Buddha statue carved from a single block of jade. That’s why Wat Phra Kaew is also called the Temple of the Emerald Buddha. Despite its small size of 26 inches high, the statue is an important cultural icon for Thai people. It’s a huge complex, so you need to allocate at least 1-2 hrs to wander around. Dress code: As this is the most sacred site in Thailand, short pants, shirts without sleeves and bare feet aren’t allowed, so remember to wear proper clothes or rent sarongs at the entrance with a 200 baht deposit. Like other tourist sites, at the entrance there are some scammers who may approach you and say that the palace is closed or offer you a cheap tuk-tuk tour; just ignore them. Wat Pho is right behind the The Grand Palace, so it’s an easy ten minute walk between them. Built nearly 200 years ago during the Ayutthaya Period, Wat Pho is Bangkok’s largest and oldest temple. 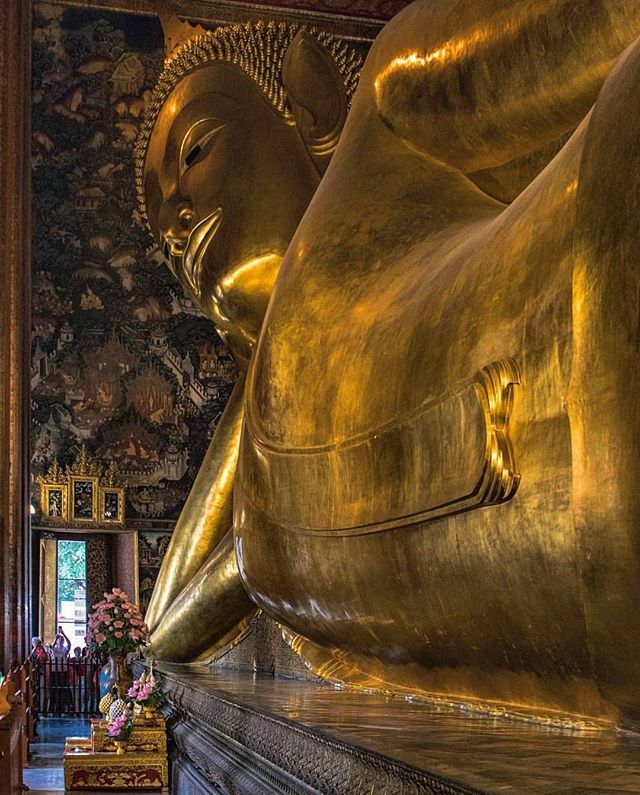 The highlight for most people visiting Wat Pho is, of course, the 46m long and 15m Reclining Buddha statue. You have to see this enormous golden image for yourself because no words can describe the amazing feeling of taking it in the sight and even photos are unable to fully capture it due to its massive size. If it isn’t enough to impress you, Wat Pho also boasts a collection of more than 1000 Buddha images scattered over the ground, which is more than any other temples in Thailand. In addition, Wat Pho serves as home to a massage school. Why wouldn’t you drop in for a traditional Thai massage after exploring the temple? Wat Arun is located on the opposite side of Wat Pho. To get there, you just need to take a ferry for about 3 baht across Chao Pharaya river. The temple’s biggest attraction might be a massive 73m high “prang” (Khmer – style tower), which is decorated with Chinese ceramic tiles and colorful pieces of porcelain. At each of the four corners of the central tower is another smaller tower. Due to its unique design, Wat Arun is considered to be the most beautiful one in Bangkok. 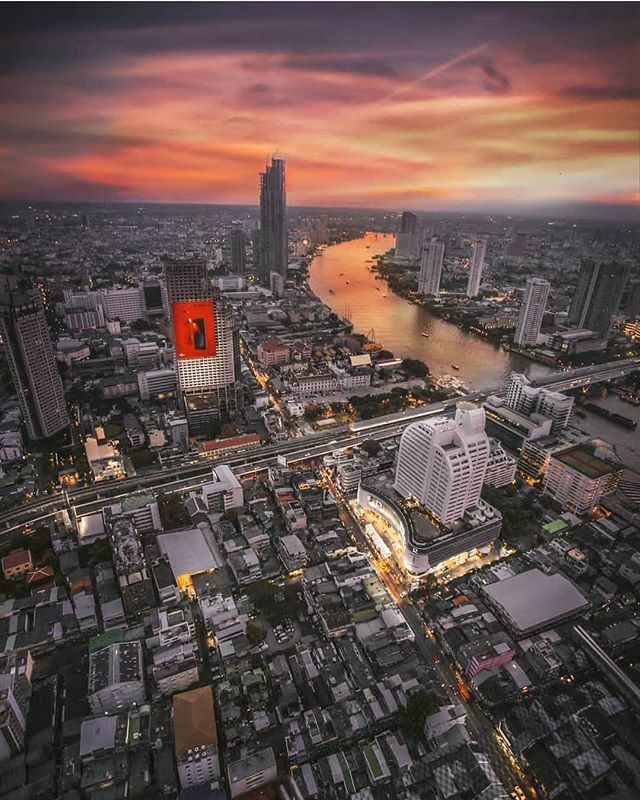 For something more adventurous, you can climb a little way to the top level of main tower, where you will be rewarded with a panoramic views over Chao Phraya River. Once you finish visiting Wat Arun, it should be around 5 pm. After many hours exploring the city of Bangkok, what better idea than stopping a bit to relax your tired feet. It’s also the perfect time to enjoy a sunset view while standing along Chao Phraya River bank. 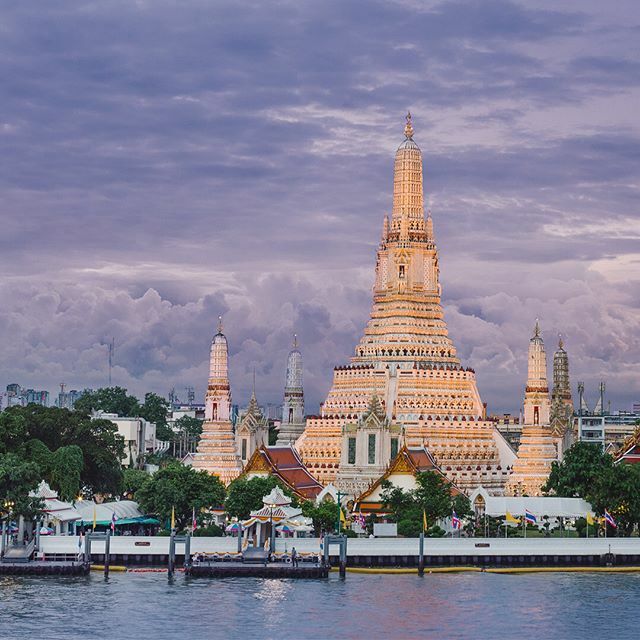 The combination of Wat Arun with the multicolored sunset will take your breath away. After leaving Wat Arun, the sky starts to turn dark in Bangkok, and it’s time for dinner. Hop on a Chao Phraya Express boat and take it to No.4 Marine Dept pier. It’s a 10 minute walking distance from there to Bangkok China Town. During the day, China Town is always bustling with shoppers, sellers, diners and tourists. When night falls, street food vendors come out to light up Chinatown’s sidewalks. The main road here is Yaowarat Road, where you can find hundreds of food stalls tempt and invite you with delicious smells from their cooking pans. Try to enjoy as many tasty dishes as you can like dumplings, dim sum, oyster omelets, fresh seafood, seasonal fruits, homemade ice cream and especially, Yaowarat toasted bread. If you have chance to discover China Town in the day time, pay Wat Traimit a visit too. It is actually home to one of world’s largest solid gold Buddha statues. The entrance fee is only 40 baht/ person. 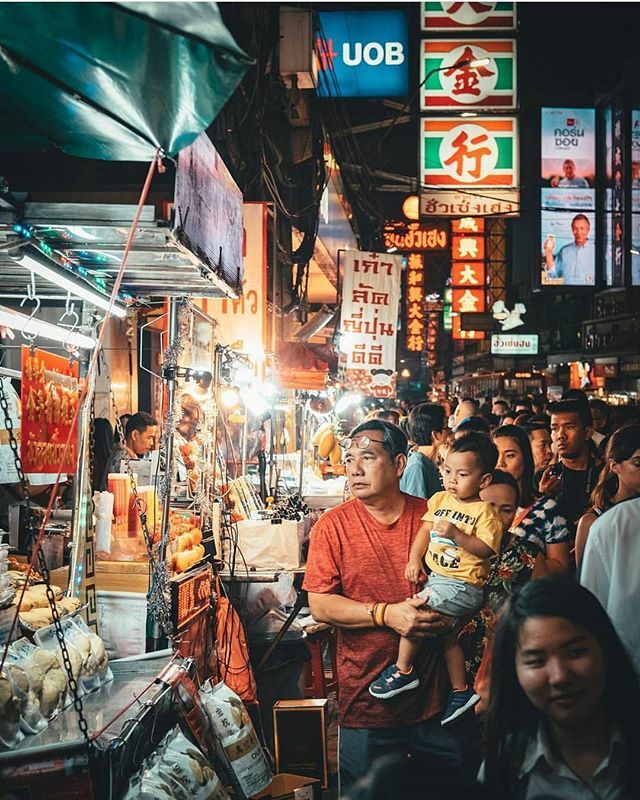 If you happen to be in Bangkok at the weekend, Chatuchak market should be the first choice when it comes to shopping at night markets in Bangkok. Many stalls do not open until after 8 am or even 9 am, so you don’t need to wake up early. Covering an area of 10,000 hectares, Chatuchak is the largest market in Thailand. There are 27 different sections, including more than 8,000 stalls that sell all kinds of products. Therefore, once you find out an item you’re looking for, you should probably buy it right away because the chance of being able to find that stall again are fairly slim! Of course, feel free to make a bargain! The more you can buy of an item, the better price you will pay for it. After hours of non-stop shopping, check out the endless stalls of food throughout the entire market. Opening Time: Wed – Thurs: 6 am to 6 pm (Plants and Flowers only); Fri: 6pm – 12am; Sat – Sun: 9am – 6pm. How to get there: You can take the BTS from the nearest station and get off at Mo Chit Station. After exiting the station by exit number 1, just follow the crowd to the market entrance. Or else, you can take the subway to Chatuchak Park station, then again, follow the crowd. If you’re not in Bangkok at the weekend, you can start your shopping day in the Siam area. This is a pride of Bangkok. 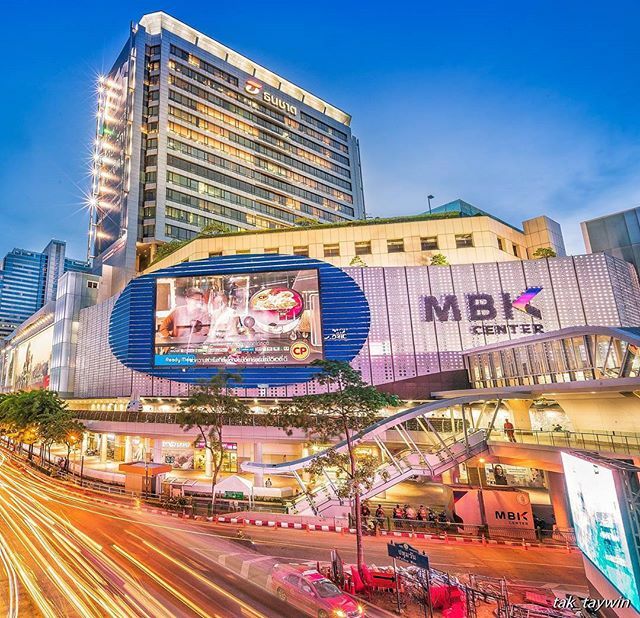 You can spend hours and hours exploring numerous big shopping centres, including Central World, Siam Paragon, Siam Center, Siam Discovery, and MBK Center, all within walking distance from one to another. It’s no surprise that a variety of brand name stores like Louis Vuitton, Chanel, Armani… can be easily found here while hanging around. If you have time, check in the largest aquarium in Southeast Asia: the Siam Ocean World in Siam Paragon. 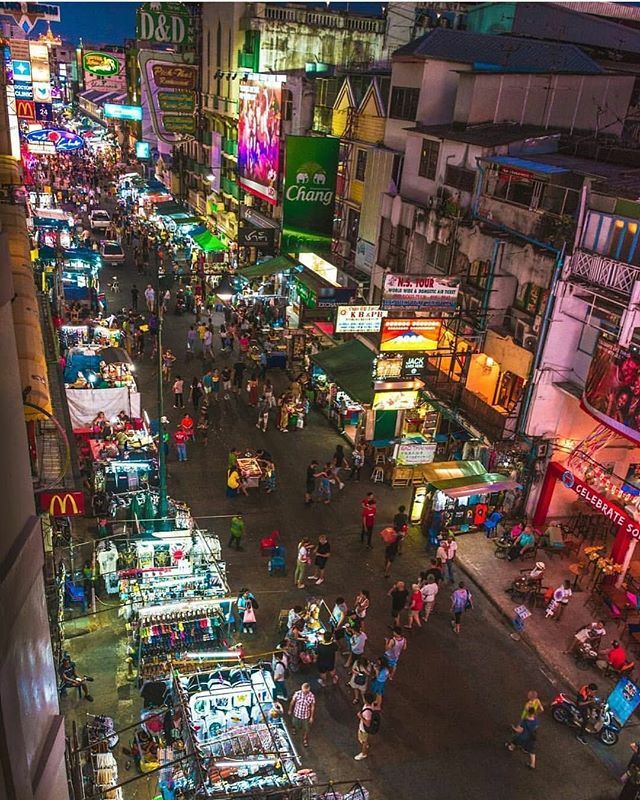 Enjoying the essence of Bangkok nightlife at Khaosan Road comes as one of most recommended things to do in Bangkok. 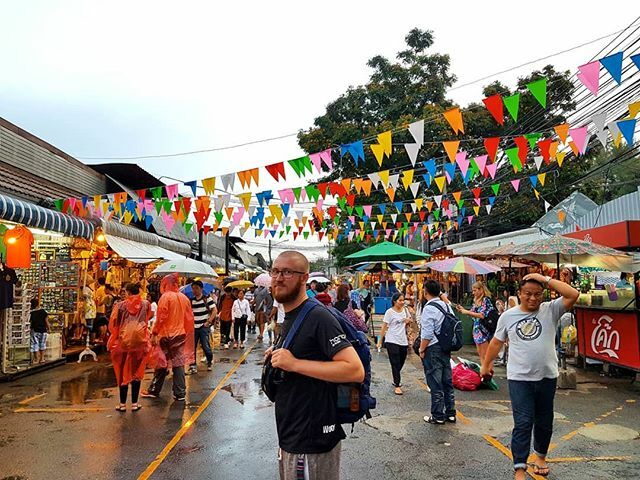 Khao San Road is Bangkok’s haven for foreign backpackers with tattoo shops, Thai massage parlours, street food stalls, cheap clubs and bars in every corner. Much like its name sounds, it is boisterous and noisy, overflowing with energetic partying people. You’ll easily find an endless supply of new friends from all over the world to meet and start random conversations. Moreover, there is no shortage to street foods on Khao San Road: spring rolls, grilled meat skewers, roti, coconut ice cream, fresh fruit, smoothies… But, pad Thai is must-try here! After all, take time to sit back and enjoy a cold drink after an entire day going shopping. If the noise and activity of Khao San Road isn’t your scene, Soi Rambuttri — which is about a minute’s walk from Khao San itself — is a great escape from the hustle and bustle. This is a quieter and more relaxed street that’s home to a range of bars, restaurants, cafes, bookstores and other shops. 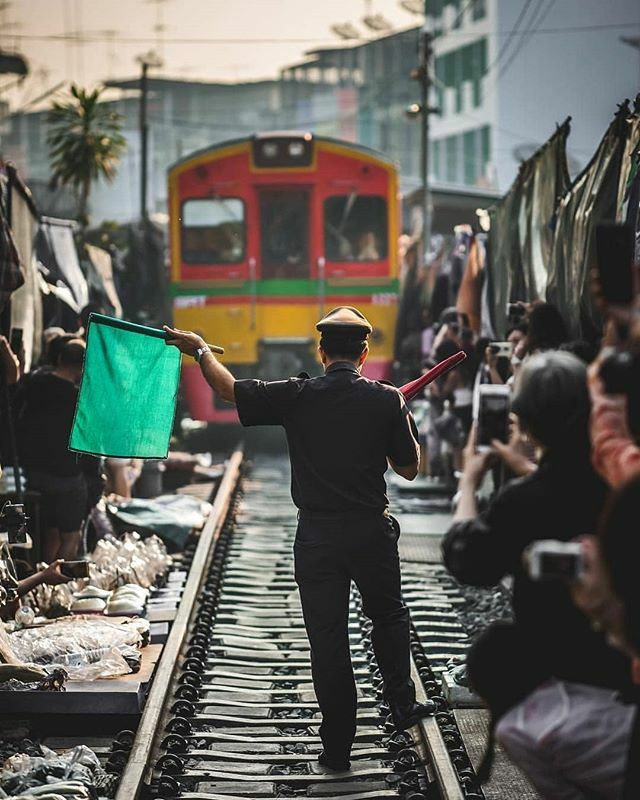 Let’s start your trip with a visit to the Maeklong Railway Market. Like other markets, its stalls sell a range of fruits, meats, seafood, as well as sweet snacks, clothing, and flowers. But what makes it different is that there are train tracks running all the way through the market. Just a few minutes before the train comes, a little warning bell goes off. Witness markets and vendors clearing up their stalls before the train comes; truly a unique scene! Preparing camera to capture this moment is one of main things to do. From the Maeklong Railway Market, you can take a short drive to the boat pier and take a trip along the canals. 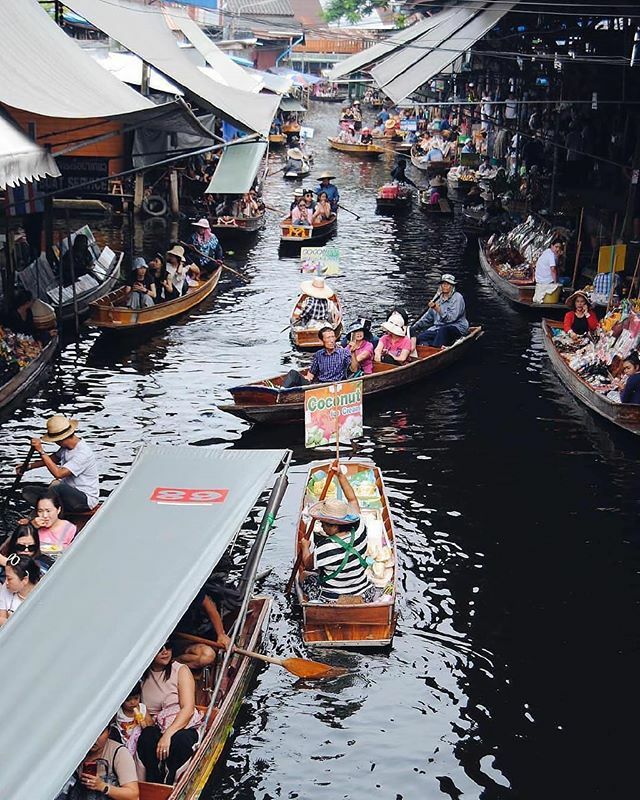 This will lead you to Damnoen Saduak Floating Market – one of the oldest floating markets in Thailand. Although lacking some of its original authenticity, the market is still a great day trip from Bangkok. Wandering along the banks of the narrow canals, you can find a variety of souvenir items like local handicrafts, assorted silks, handcrafted jewelry,… and many other tasty dishes, including coconut pancakes, boat noodles, fresh seafood and coconut ice cream. The best time to visit this market is in the morning, when you can see the locals going about their lives, before all the tourists come and the market becomes a tourist trap. After a busy day in hot and sticky Bangkok, it’s time to get back to your room to freshen up before enjoying your last night in Bangkok. Don’t leave Bangkok without enjoying pad Thai at Thip Samai restaurant! Thip Samai is open from 5pm to about 2am. At any time, you will see a long queue of people waiting in front of the restaurant, from the locals to tourists. Considered by many as the best Pad Thai in all of Bangkok, both in its presentation and taste. 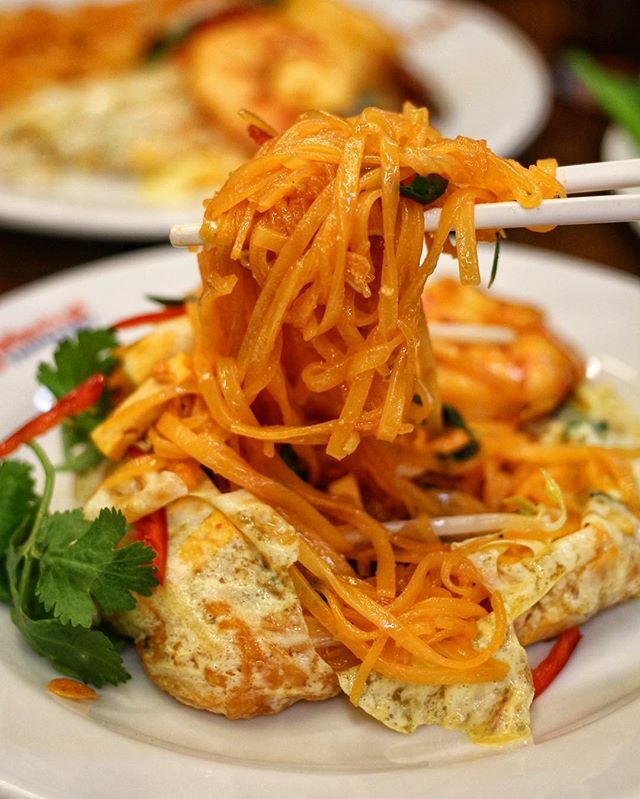 The most popular dish is Pad Thai Haw Kai Goong Sot – Pad thai wrapped in egg. Firstly, the dry noodles are flavored with soy sauces and other ingredients like tofu, baby shrimp, leeks, bean sprouts, and other ingredients per recipe. Then the cook will fry a thin layer of egg in large pan, and finally pour the plate of freshly cooked Pad Thai into the middle of the egg, wrapped up on all sides, and placed back onto the plate. There you have an ideal itinerary including many things to do in Bangkok in 3 days. You can mix it up as long as it suits you best. If you have a local guide on this route, that would make your days more enjoyable. Have a wonderful time in Bangkok!